The mechanisms whereby vitamin A stimulates the immune system are poorly understood. In the current study, we attempted to elucidate the potential mechanisms of action of all-trans retinoic acid (atRA) on proliferation of human T lymphocytes. We found that physiological levels of atRA potently augmented T cell proliferation when added in combination with common T cell-stimulating agents. This was reflected in a time- and concentration-dependent stimulation of the cell cycle machinery. The presence of atRA led to elevated levels of cyclin D3, -E, and -A, decreased levels of p27Kip1, increased activity of cyclin-dependent kinase 2, and enhanced phosphorylation of the retinoblastoma protein (pRB). The atRA-mediated changes in the cell cycle machinery were late events, appearing after 20 h of stimulation, indicating that the effects of atRA were indirect. atRA did not alter the expression of the high-affinity IL-2R. However, the level of IL-2 secreted by T cells was strongly enhanced by atRA. rIL-2 was able to substitute for the effects of atRA on the cell cycle machinery and on DNA synthesis, and blocking the IL-2R markedly inhibited atRA-induced cell proliferation and pRB phosphorylation. A retinoic acid receptor (RAR)-selective agonist and 9-cis-RA had the same potency as atRA on T cell proliferation and IL-2 secretion, whereas a retinoid X receptor-selective agonist had only marginal effects. Furthermore, a RAR-selective antagonist completely suppressed T cell proliferation and pRB phosphorylation induced by atRA. Taken together, these results suggest that atRA stimulates the cell cycle machinery and proliferation of normal human T cells by increasing IL-2 secretion through mechanisms involving RARs. Vitamin A plays an important role in the regulation of immune function (1, 2). Vitamin A deficiency is associated with decreased resistance to infection (3) and both specific and nonspecific responses are impaired. Supplementation of vitamin A generally improves immune function in vitamin A-deficient animals and enhances immune responses to certain Ags in vitamin A-depleted children (4). In apparent contrast to the findings that vitamin A protects against infections, we previously reported that physiological levels of retinoids inhibit the proliferation of normal peripheral blood B lymphocytes (5, 6), as well as B cell precursors from bone marrow (7). In support of these observations, we recently showed that in B cells, retinoic acid (RA)3 inhibits the cell cycle machinery responsible for G1- to S-phase transition (8). These observations suggested to us that rather the T cell compartment could be the major target for vitamin A action in stimulating the specific part of the immune system. The effects of vitamin A are primarily mediated via its acid derivatives, including all-trans- and 9-cis RA (atRA and 9cRA) (2). These isomeric forms of RA are ligands of two families of nuclear RA receptors, the RA receptors (RARs) and the retinoid X receptors (RXRs), of which there are several isoforms (9, 10). In the presence of atRA, RAR and RXR form heterodimers, and activate transcription through binding to RA response elements near target genes (11, 12). The existence of stable RA analogs specific for RARs and RXRs, respectively (13), in addition to selective antagonists (14), permit elucidation of the receptor pathway involved in vitamin A responses. In the body, T cells are activated by interactions between TCR and Ags displayed on the surface of APCs, and this, together with a second costimulatory signal, triggers a cascade of events that culminates in IL-2 production which drives the cells to proliferate (15). Activation of T lymphocytes in vitro can be mimicked by a variety of natural and synthetic compounds such as anti-CD3- and anti-CD28 Abs, Con A, PHA, and 12-O-tetradecanoylphorbol 13-acetate (TPA) (16, 17). The tumor-promoting phorbol ester TPA activates T cells by mimicking diacylglycerol in activation of protein kinase C (PKC) (18) and thereby bypasses the need for Ag binding (19, 20). Passage through the cell cycle is a highly regulated process involving sequential activation of a series of cell cycle control proteins (21). Phosphorylation of the tumor suppressor gene product, the retinoblastoma protein (pRB), appears to be a key event in regulating the entry of cells into S phase (22). By phosphorylation of pRB, transcription factors such as E2Fs are released from their complex with pRB leading to transcription of S-phase genes (23). Phosphorylation of pRB during mid- to late G1 is accomplished by mitogen-activated cyclin D- and cyclin E-associated kinases, and later by cyclin A-associated kinase (24). Activation of these cyclin-dependent kinases (CDKs) depends not only on assembly with cyclin, but also on the correct stoichiometric ratio between the kinases and certain kinase inhibitors such as p16Ink4, p21Cip1, and p27Kip1, collectively termed cyclin-dependent kinase inhibitors (CKIs; Ref. 25). In B cells, we have previously observed that atRA induced rapid dephosphorylation of pRB concomitant with an increased level of p21Cip1 and decreased levels of cyclin E and cyclin A (8). In the current study, we have focused on peripheral blood T lymphocytes with the purpose of understanding how atRA regulates proliferation in these cells. We demonstrate that atRA strongly potentiates the proliferation of peripheral blood T cells by stimulating the cell cycle machinery leading to G1- to S-phase transition. Furthermore, our results indicate that atRA mediates these effects by increasing IL-2 secretion through mechanisms that involve RARs. TPA, RA (all-trans and 9-cis), 4-((E)-2-(5,6,7,8-tetrahydro-5,5,8,8-tetramethyl-2-naphthalenyl)-1-propenyl)benzoic acid (TTNPB), ionomycin, Con A, 5-bromo-2′-deoxyuridine (BrdU), and propidium iodide (PI) were purchased from Sigma-Aldrich (St. Louis, MO). SR11217 was provided by Dr. M. I. Dawson (Life Science Division, SRI International, Menlo Park, CA) and Ro 41-5253 was provided by Dr. M. Klaus (Hoffman-La Roche, Basel, Switzerland). Dynabeads anti-CD3/CD28 T cell expander was obtained from Dynal Biotech (Oslo, Norway). The retinoid compounds were dissolved in ethanol or DMSO, flushed with argon, and stored in light-proof containers at −20°C. All experiments were performed in subdued light. Controls were run using the same concentrations of diluents as present in the retinoid solutions, and these concentrations of diluents had no effects. Specific mouse mAbs anti-CD3ε mAb OKT3 were purified from hybridoma culture supernatants. Abs against the IL-2R were purified from supernatants of the mouse hybridoma cell line 2A3A1H (American Type Culture Collection, Manassas, VA). Anti-cyclin E- (HE12), anti-cyclin A- (C-19), anti-CDK2- ((M2)-G), anti-cyclin D3- (D-7), and anti-p27Kip1- (C-19) Abs were obtained from Santa Cruz Biotechnology (Santa Cruz, CA). FITC-conjugated anti-BrdU Ab and anti-pRB Ab (G3-254) were purchased from BD PharMingen (San Diego, CA). FITC-conjugated anti-CD25- (IL-2R α-chain) and FITC-conjugated anti-IgG1 Abs were obtained from Diatec (Oslo, Norway). Human rIL-2 was purchased from R&D Systems (Minneapolis, MN). T cells were negatively selected from peripheral blood obtained from healthy blood donors from the Blood Bank at Ullevaal Hospital (Oslo, Norway). Mononuclear cells were isolated by Ficoll-Hypaque (Lymphoprep; Nycomed, Oslo, Norway) density gradient centrifugation according to Boyum et al. (26). To remove monocytes, the cells were diluted to 107 cells/ml in RPMI 1640 (Life Technologies, Grand Island, NY), and incubated with 70 mg/ml carbonyl iron (Sigma-Aldrich) for 1 h at 37°C. The monocytes that had phagocytosed carbonyl iron particles were then absorbed to a samarium cobalt magnet, and the remaining lymphocytes were recovered from the supernatant. PBLs were mixed with Dynabeads coated with anti-CD14 Ab (product no. 111.11), anti-CD19 Ab (product no. 111.04), and anti-HLA class II Ab (product no. 111.23), all from Dynal Biotech, in a cell-bead ratio of 1:4. After incubation of the mixture on a rotating wheel for 45 min at 4°C, the rosetted cells were attracted to a samarium cobalt magnet and the T cells were recovered from the supernatant. The purity of the T cell population was analyzed by flow cytometry using Abs against CD3. The average yield of CD3-positive T cells varied between 85 and 95%. T cells were cultured at 1.5 × 106 cells/ml in RPMI 1640 supplemented with 10% heat-inactivated FBS (Life Technologies), 2 mM glutamine, 125 U/ml penicillin, and 125 μg/ml streptomycin at 37°C in a humidified incubator with 5% CO2. For measurement of DNA synthesis, cells were cultured in microtiter plates at an initial density of 105 cells/0.2 ml. Cells were pulsed with 0.2 μCi of [3H]thymidine (Amersham, Buckinghamshire, U.K.) for the last 20 h of a 68-h incubation. The cells were then harvested on a cell harvester and counted on a liquid scintillation counter (Topcount; Packard Instrument, Meriden, CT). The cell cycle distribution was assessed by pulse labeling the cells with BrdU 1 h before harvesting. The cells were fixed in 70% ethanol before staining the cells with a FITC-conjugated anti-BrdU Ab and PI (27). The percentage of BrdU-positive cells and the cell cycle distribution of 10,000 cells was analyzed using a FACScan flow cytometer (BD Biosciences, San Jose, CA) according to the manufacturer’s procedure. Total cell lysates were prepared by lysing 5 × 106 cells for 20 min on ice in Triton X-100 lysis buffer (50 mM Tris, pH 7.5, 250 mM NaCl, 0.1% Tween X-100, 10 μg of leupeptin/ml, 9.5 μg of aprotinin/ml, 35 μg of PMSF/ml, 5 mM NaF, 0.1 mM orthovanadate, 10 mM β-glycerophosphate). Cellular debris was removed by centrifugation at 4°C, and the protein content of the supernatant was determined by Bradford analysis (Bio-Rad, Hercules, CA). Lysate corresponding to equal amounts of protein (35–70 μg) were mixed with 3× Laemmli sample buffer (28) and boiled for 5 min. The samples were resolved on 7.5 (for pRB) or 10–12% (for other proteins) polyacrylamide gel under reducing conditions, and the proteins were transferred onto a nitrocellulose membrane (Amersham) using a semidry transfer cell (Bio-Rad). After blocking in TBST (0.1% Tween 20) containing 5% nonfat dry milk for 1 h at room temperature, the membrane was incubated with 1 μg/ml of the indicated Ab in TBST for 2 h at room temperature. The membrane was then washed four times with TBST, incubated with a 1/6000 dilution of HRP-linked secondary Ab (Bio-Rad), and the immunoreactive proteins were visualized with the ECL detection system (Amersham). For histone H1 kinase assays, whole cell extracts were prepared by incubating 107 cells for 20 min on ice in Triton X-100 lysis buffer as described above, and the lysates were cleared by centrifugation at 4°C. After preclearing with 20 μl of 1:1 slurry of protein G-Sepharose beads (Amersham Biosciences, Uppsala, Sweden) for 30 min at 4°C, 400 μg of each lysate was immunoprecipitated with 2 μg of anti-CDK2 Ab. The immunocomplexes were adsorbed onto 30 μl of a 1:1 slurry of protein G-Sepharose beads for 1 h at 4°C, collected by centrifugation at 400 × g for 5 min and washed twice with lysis buffer, and once with kinase buffer (50 mM Tris, pH 7.5, 10 mM MgCl2, 1 mM DTT, 2 mM EGTA, 1 mM NaF, 0.1 mM orthovanadate, 10 mM β-glycerophosphate). The beads were then resuspended in 15 μl of kinase buffer containing 30 μM ATP, 5 μg of histone H1 (Upstate Biotechnology, Lake Placid, NY), and 10 μCi of [γ-32P] ATP per reaction mixture and incubated for 30 min at 30°C. Reactions were stopped by the addition of 7.5 μl of 3× Laemmli sample buffer (28). The samples were boiled for 5 min, and subjected to SDS-PAGE. Following electrophoresis, gels were stained with Coomassie blue, dried, and subjected to autoradiography. Isolated lymphocytes were pelleted, washed with PBS containing 2% FBS, and resuspended to 5 × 106 cells/ml. Cells (5 × 105) were incubated with FITC-conjugated anti-CD25 (IL-2R α-chain) Ab or FITC-conjugated anti-IgG1 Ab (isotype-matched control) for 1 h at 4°C. Cells were subsequently washed three times, resuspended in 0.5 ml PBS containing 2% FBS, and analyzed on a FACScan flow cytometer (BD Biosciences) according to the manufacturer’s procedure. T cells (105 cells/0.2 ml) were cultured as described for assessment of DNA synthesis. After 24 h, cells were centrifuged and the cell-free supernatants were stored at −80°C. The IL-2 levels were determined in parallel by ELISA according to the manufacturer’s procedure (R&D Systems). Statistical analysis was performed using the Wilcoxon-signed rank test. To study the effect of retinoids on T cell proliferation, we used atRA, which is the major active retinoid metabolite in target cells. atRA is present in peripheral blood at a concentration of ∼10 nM (29) and it has been shown that atRA can be directly taken up by cells both in vitro and in vivo (30, 31). The major source of retinoids for target cells in vivo is however retinol bound to retinol- binding protein or retinylester in chylomicron particles (32). However, we have previously shown that atRA could substitute for retinol bound to retinol-binding protein or retinylesters in their effects on normal B cells (5), and, therefore, we routinely use atRA as a source for retinoids in lymphocyte assays. Proliferation was assessed by measuring the incorporation of [3H]thymidine into DNA, a frequently used method to estimate cell proliferation in lymphocytes (33, 34). A range of common T cell activators (anti-CD3ε (OKT3), anti CD3 + anti CD28 Abs, Con A, TPA + ionomycin and TPA) was tested for atRA responses (Fig. 1⇓A). atRA potentiated cell proliferation induced by all agents tested. The most pronounced and consistent response was obtained when using TPA as the stimulant. 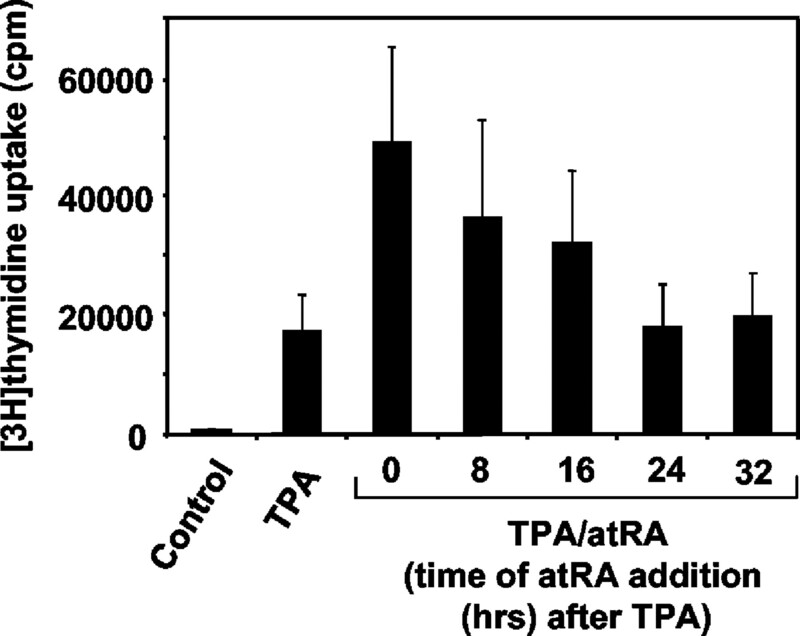 In 10 independent experiments using TPA as stimulant, atRA induced proliferation 3.5-fold (p = 0.005, data not shown). Therefore, we decided to use TPA as the T cell activator in the additional experiments. However, it should be noted that a smaller, but statistically significant, effect of atRA on proliferation was observed also when using the more physiological T cell stimulant anti-CD3ε (OKT3). In six independent experiments, atRA induced a 1.8-fold stimulation (p = 0.046, data not shown). atRA increases DNA synthesis and S-phase entry. Human T cells were isolated as described in Materials and Methods. A, T cells (105/0.2 ml) were stimulated with anti-CD3ε Ab (OKT3; 1 μg/ml), anti-CD3/CD28 T cell expander (α-CD3 + CD28; 0.125 μl/well), Con A (4 μg/ml), TPA (10−8 M) and ionomycin (I; 0.5 M), or TPA (10−8 M) in the presence or absence of atRA (1 μM). Cells were cultured in triplicates and [3H]thymidine incorporation was determined as described in Materials and Methods. Incorporation of [3H]thymidine is expressed as the mean of fold induction compared with medium control ± SEM of three independent experiments. B, T cells (105/0.2 ml) were stimulated with TPA (10−8 M) in the presence or absence of atRA at indicated concentrations (nanomoles per liter) as described in A. Incorporation of [3H]thymidine is expressed as the mean ± SEM of four independent experiments. C, Cells (1.5 × 106 cells/ml) were stimulated with TPA (10−8 M) in the presence or absence of atRA (1 μM). The kinetics of the effect of atRA on T cell DNA synthesis were determined by flow cytometric analysis following labeling of the cells with BrdU for 1 h and staining with PI as described in Materials and Methods. The percentage of cells in S phase is indicated. One representative experiment of three is shown. atRA potentiated DNA synthesis of TPA-stimulated T cells in a concentration-dependent manner, the effect being noted at 1 nM, but was optimal at a concentration of 1 μM (Fig. 1⇑B). Concentrations of atRA above 1 μM are generally known to be toxic, and led to decreased [3H]thymidine incorporation (data not shown). In the absence of mitogens, atRA had no effect on proliferation (Fig. 1⇑B). The stimulatory effect of atRA on proliferation was confirmed by flow cytometric analysis of cells after incorporation of BrdU and staining with PI. As shown in Fig. 1⇑C, atRA markedly enhanced the number of cells in S phase. This was first noted after 32 h and increased with time. After 48 h, atRA had caused a 4-fold increase in the number of cells entering into S phase (Fig. 1⇑C). Interestingly, the ability of atRA to enhance T cell proliferation depended on the time of atRA addition (Fig. 2⇓). By adding atRA 8 h after the addition of TPA, the proliferative effect was already diminished, and when added 24 h after TPA, virtually no effect of atRA was seen (Fig. 2⇓). This suggests that atRA might affect some early event in the transition of T lymphocytes from G1- to S phase. Effect of adding atRA at various time points. atRA (1 μM) was added to cell cultures (105/0.2 ml) at the indicated times (hours) after stimulation of the cells with TPA (10−8 M). [3H]Thymidine incorporation was measured as described in Materials and Methods. The vertical bars indicate the mean ± SEM of four independent experiments. To exclude the possibility of interference from contaminating cells in the T cell population, the effect of atRA in positively selected CD4-positive cells was examined. We observed that atRA enhanced the proliferation of T cells to the same degree in this highly pure cell population as in negatively isolated T cells (data not shown). A similar response was noted in T cell cultures depleted of CD56-positive NK cells (data not shown), indicating that NK cells do not interfere with the T cell response. Functional inactivation of pRB by phosphorylation at multiple sites is required for G1- to S-phase transition (22). Phosphorylated pRB proteins are visualized as slower-migrating forms of the protein on SDS-polyacrylamide gels. As shown in Fig. 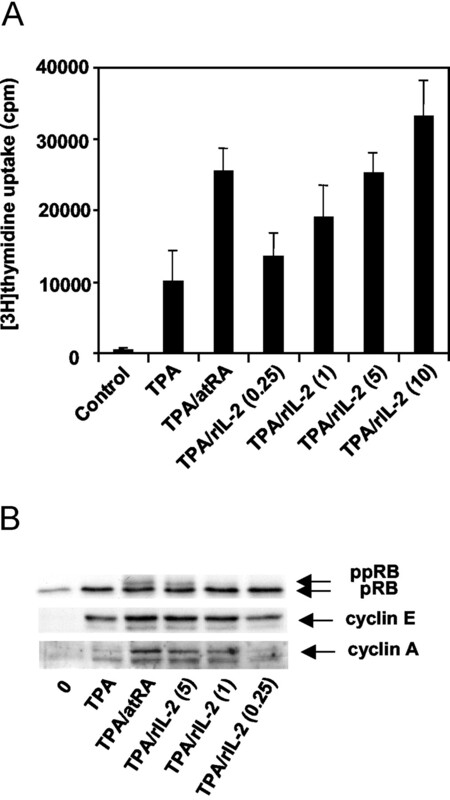 3⇓, atRA enhanced TPA-mediated phosphorylation of pRB after 32 h in a concentration-dependent manner. The effect was maximal at a concentration of 1 μM. In contrast to the rapid effect of atRA on pRB phosphorylation in B cells reported previously (8), the changes in pRB phosphorylation in T cells appeared 20 h after atRA addition (Fig. 4⇓). atRA-mediated changes in pRB phosphorylation and expression of cell cycle regulatory proteins in G1. Isolated human T cells (1.5 × 106 cells/ml) were stimulated for 32 h with TPA (10−8 M) in the presence or absence of atRA at the indicated concentrations (nanomoles per liter). 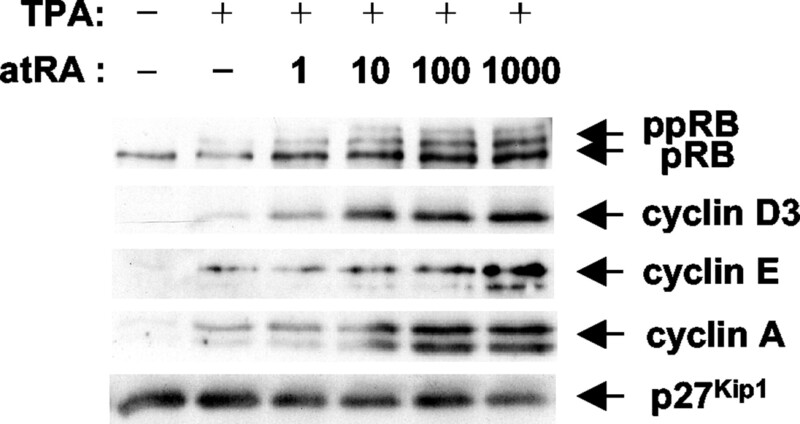 Total cell lysates were prepared and equal amounts of total protein (35 μg for pRB, 70 μg for cyclins and p27Kip1) were subjected to Western blot analysis as described in Materials and Methods using Abs against the proteins indicated on the right. Hypophosphorylated pRB and hyperphoshorylated pRB (ppRB) were detected using mAb specific for pRB. One reproducible experiment of two is shown. Kinetics of atRA on pRB phosphorylation and expression of cell cycle regulatory proteins in G1. T cells (1.5 × 106 cells/ml) were stimulated with TPA (10−8 M) in the presence or absence of atRA (1 μM) or TTNPB (100 nM). Total cell lysates were prepared at the indicated times (hours) and equal amounts of total protein (35 μg for pRB, 70 μg for cyclins and p27Kip1) were subjected to Western blot analysis as described in Materials and Methods with Ab against the proteins indicated on the right. The lane indicated as 0 refers to a sample harvested before mitogenic stimulation of the cells. One representative experiment of four is shown. Phosphorylation and inactivation of pRB are mediated by CDKs. Activation of CDKs is the result of correct complex formation with cyclins and CKIs, as well as phosphorylation and dephosphorylation of certain amino acids in the CDK proteins (35). By Western blot analysis, we demonstrated that atRA increased TPA-induced expression of cyclin D3, cyclin E, and cyclin A in a time-dependent manner, concomitant with reduced levels of p27Kip1 (Fig. 4⇑). atRA had no effect on the protein levels of cyclin D2, CDK2 or p21Cip1 (data not shown). To confirm the implications of increased levels of the cyclins and decreased level of p27Kip1, we conducted an in vitro CDK2 kinase assay using histone H1 as substrate. As shown in Fig. 5⇓, TPA induced a low level of CDK2 activity, whereas atRA strongly increased the kinase activity. atRA increases CDK2 activity. Mitogenic stimulation, atRA treatment, and harvesting of the cells were performed as described in the legend to Fig. 4⇑. Total cell lysates were prepared and equal amounts of whole cell extracts (400 μg of protein/sample) were immunoprecipitated with Ab against CDK2, followed by the kinase assay using histone H1 as substrate as described in Materials and Methods. The lane indicated as 0 h refers to a sample harvested before mitogenic stimulation of the cells. IP, immunoprecipitating Ab. One of three reproducible experiments is shown. As evident from Fig. 3⇑, atRA stimulated the components of the cell cycle machinery in a concentration-dependent manner, with an optimal effect noted at 1 μM. However, the changes in the protein levels were late events, first appearing 20 h after atRA addition (Fig. 4⇑). The time- and concentration-dependent effects of atRA on the cell cycle parameters closely resembled that on pRB phosphorylation, indicating a causative relationship between these events. However, the slow changes in the cell cycle protein levels induced by atRA indicated that in T cells, atRA does not affect the cell cycle machinery directly. Due to the vital role of IL-2 in the growth and clonal expansion of T cells (36), we examined the effect of atRA on IL-2R expression and IL-2 production. The IL-2R comprises three subunits: IL-2Rα (CD25), IL-2Rβ, and IL-2Rγ, forming high-affinity receptors when all three subunits are present (37). T lymphocytes can regulate their responsiveness to IL-2 through transcriptional control of one of the components of the high-affinity receptor, namely the IL-2Rα gene (38). Using flow cytometric analysis, we observed that TPA induced expression of the IL-2R α-chain after 24 h, but the expression of this subunit was not affected by atRA (Fig. 6⇓). In contrast, atRA potently enhanced IL-2 protein secretion (Fig. 7⇓A) and the effect was notable at 8 h (Fig. 7⇓B). In atRA-treated cells, the level of secreted IL-2 after 24 h varied between 0.02 and 6 ng/ml (T cells from eight donors were analyzed) reflecting the biological diversity between human donors. The average level secreted at 24 h was 1.5 ± 0.7 ng/ml (SEM, p = 0.041, n = 8; Fig. 7⇓A). Effect of atRA on the expression of CD25. T cells (1.5 × 106 cells/ml) were stimulated with TPA (10−8 M) in the presence or absence of atRA (1 μM) for 24 h and were stained with FITC-conjugated anti-CD25 Ab as described in Materials and Methods. An isotype-matched irrelevant anti-IgG1 Ab was used as a negative control (top panel). The fluorescence intensity is given in logarithmic scale. One representative experiment of three is shown. atRA increases IL-2 secretion. T cells (105/0.2 ml) were stimulated with TPA (10−8 M) in the presence or absence of atRA (1 μM) for 24 h (A) or for the indicated times (hours) (B) as described in Materials and Methods. The cell-free supernatants were examined for IL-2 secretion as described in Materials and Methods. A, Vertical bars indicate the mean ± SEM of eight independent experiments; ∗, p = 0.041. Because atRA increased IL-2 production in T cells, it was of interest to determine whether IL-2 could replace the effect of atRA on T cell proliferation. 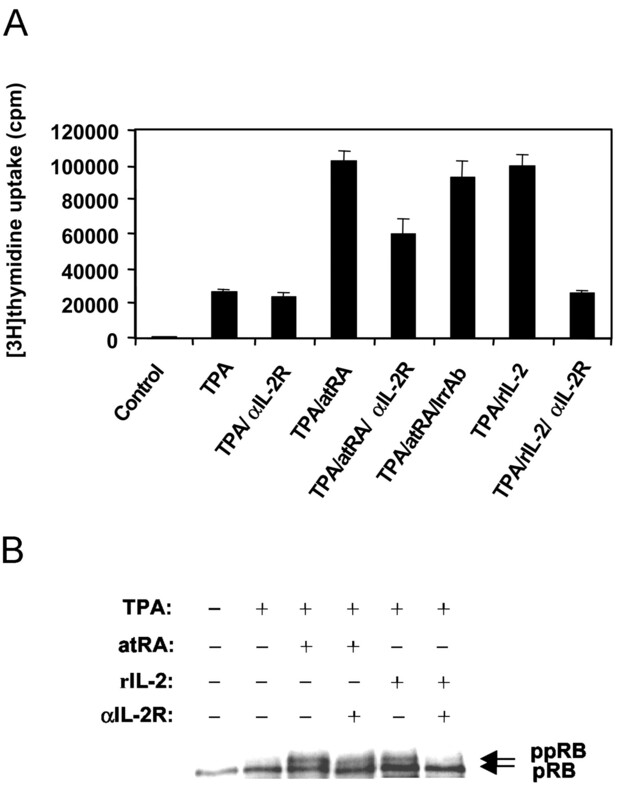 Addition of rIL-2 to TPA-stimulated T cells had the same effect as atRA on DNA synthesis (Fig. 8⇓A), but on average, a higher concentration of rIL-2 was needed to replace the effect of atRA than the level of IL-2 usually induced by atRA. The amount of rIL-2 needed to mimic the proliferative effect of atRA was donor-dependent and in the range of 0.25–10 ng/ml. The average concentration of rIL-2 needed to restore the effect of atRA was 4.9 ± 0.9 ng/ml (SEM, n = 10). To examine whether rIL-2 could mimic the effects of atRA on the cell cycle machinery, we added rIL-2 to the TPA-stimulated cells and performed Western blot analyses. Indeed, 5 ng/ml rIL-2 replaced the effect of atRA on pRB phosphorylation and expression of cyclin E and cyclin A (Fig. 8⇓B). IL-2 mimics the effect of atRA on DNA synthesis and cell cycle regulatory proteins. A, T cells (105/0.2 ml) were stimulated with TPA (10−8 M) in the presence or absence of atRA (1 μM) or rIL-2 (nanograms per milliliter) as indicated. DNA synthesis was measured as described in Materials and Methods. The vertical bars indicate the mean ± SEM of 10 independent experiments. B, T cells (1.5 × 106 cells/ml) were stimulated for 32 h with TPA (10−8 M) in the presence or absence of atRA (1 μM) or rIL-2 at indicated concentrations (nanograms per milliliter). Total cell lysates were prepared and equal amounts of total protein per sample were analyzed for hypophosphorylated pRB and hyperphoshorylated pRB (ppRB), cyclin E, and cyclin A by Western blot analysis as described in Materials and Methods. The lane indicated as 0 refers to a sample harvested before mitogenic stimulation of the cells. One representative experiment of three is shown. To confirm the role of IL-2 in atRA-mediated T cell proliferation, we blocked the IL-2/IL-2R pathway by using an Ab against the IL-2R, and assessed its effects on atRA-stimulated proliferation. A significant reduction in [3H]thymidine incorporation was seen in the presence of the IL-2R blocking Ab (Fig. 9⇓A). By comparison, an isotype-matched irrelevant Ab had no effect on atRA-stimulated proliferation (Fig. 9⇓A). As a control for the efficiency of the IL-2/IL-2R pathway inhibition, we showed that the IL-2R Ab completely blocked the potentiating effect of 1 ng/ml rIL-2 on TPA-induced proliferation (Fig. 9⇓A). 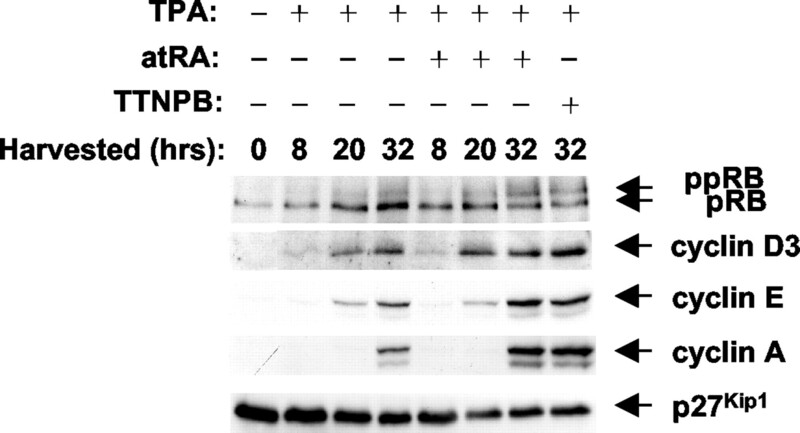 Moreover, as shown by Western blot analysis, the IL-2R Ab markedly reduced the phosphorylation of pRB mediated by atRA (Fig. 9⇓B). Again, the effect of rIL-2 was completely blocked by the IL-2R blocking Ab (Fig. 9⇓B). These results strongly indicate that induced production of IL-2 has a vital role in atRA-stimulated T cell proliferation. Blocking IL-2R inhibits DNA synthesis and phosphorylation of pRB. A, T cells (105/0.2 ml) were stimulated with TPA (10−8 M) in the presence or absence of atRA (1 μM) or rIL-2 (1 ng/ml), with or without anti-IL-2R Abs (10 μg/ml) as indicated. Cells were cultured in triplicates and [3H]thymidine incorporation (mean ± SD) was determined as described in Materials and Methods. One representative experiment of four is shown. αIL-2R, anti-IL-2R Ab; IrrAb, irrelevant Ab. B, T cells (1.5 × 106 cells/ml) were stimulated for 32 h with TPA (10−8 M) in the presence or absence of atRA (1 μM) or rIL-2 (1 ng/ml) as indicated. Anti-IL-2R Ab (10 μg/ml) was added to the cell cultures as shown. Total cell lysates were prepared and equal amounts of total protein (30 μg) were analyzed for hypophosphorylated pRB and hyperphoshorylated pRB (ppRB) by Western blot analysis as described in Materials and Methods. One representative experiment of three is shown. αIL-2R, anti-IL-2R Ab. atRA is generally believed to act through binding to ligand-dependent transcription factors (39), although some reports have proposed other mechanisms for atRA-mediated effects (40, 41). To study the contribution of the various nuclear retinoid receptors to the proliferative response and IL-2 secretion of T cells, we assessed the effect of a pan RAR agonist (TTNPB) and a RXR-selective agonist (SR11217) in addition to 9-cis RA, which is a ligand for both RAR and RXR. TTNPB and 9-cis RA fully mimicked the effect of atRA on DNA synthesis, whereas the effect of SR11217 was only marginal (Fig. 10⇓A). TTNPB was also tested on the various components of the cell cycle machinery and it was shown to fully mimic the potentiating effect of atRA (Fig. 4⇑). We also determined whether the agonists could mimic the effects of atRA on IL-2 secretion. TTNPB and 9-cis RA both strongly potentiated TPA-induced secretion of IL-2, whereas again the effect of SR11217 was marginal (Fig. 10⇓B). The RAR agonist TTNPB mimics the effect of atRA on cell proliferation and on IL-2 secretion. A, Cells (105/0.2 ml) were stimulated with TPA (10−8 M) in the presence or absence of retinoids (100 nM) as indicated. Cells were cultured in triplicates and [3H]thymidine incorporation was determined as described in Materials and Methods. The results represent the mean ± SEM of seven independent experiments. B, T cells (105/0.2 ml) were stimulated with TPA (10−8 M) in the presence or absence of retinoids (100 nM) for 24 h as described in Materials and Methods. The cell-free supernatants were examined for IL-2 as described in Materials and Methods. One representative experiment of three is shown. Finally, to verify the involvement of the RAR pathway, we used a RAR-selective antagonist, Ro 41-5253. 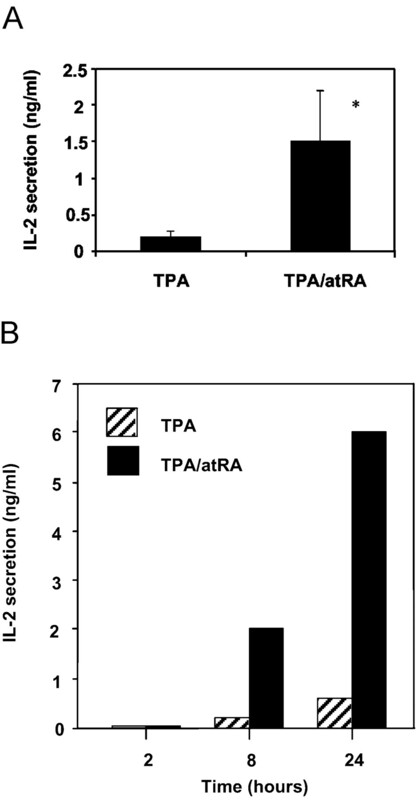 In increasing concentrations, Ro 41-5253 inhibited DNA synthesis induced by TPA and atRA (Fig. 11⇓A). A complete inhibition was noted at a concentration of 10 μM of Ro 41–5253 (Fig. 11⇓A), without affecting the viability of the cells (analyzed by PI staining, data not shown). Ro 41-5253 at 10 μM also prevented atRA-induced pRB phosphorylation, inhibited the increase in the protein level of cyclin E, and reversed the reduction of p27Kip1 induced by atRA (Fig. 11⇓B). 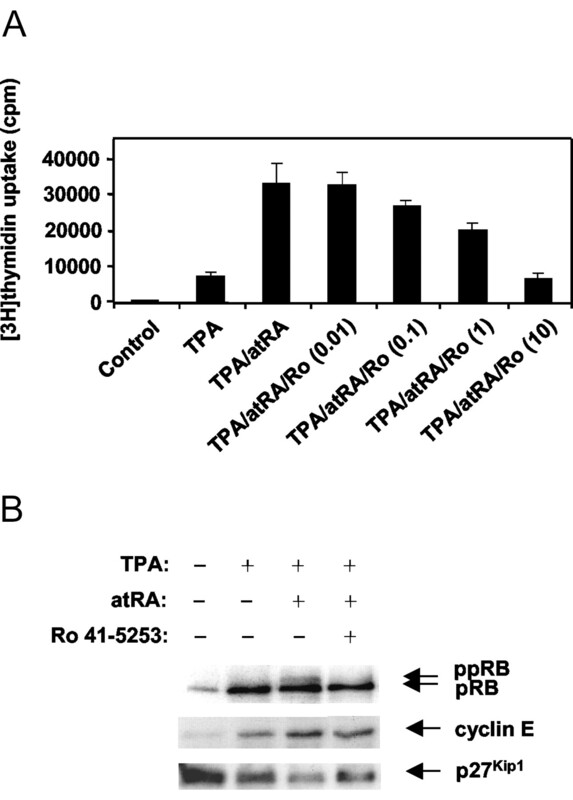 A RAR-selective antagonist abolishes the effect of RA on proliferation and pRB phosphorylation. A, T cells (105/0.2 ml) were stimulated with TPA (10−8 M) in the presence or absence of atRA (10 nM) and Ro 41-5253 in increasing concentrations (micromoles per liter) as indicated. Cells were cultured in triplicates and [3H]thymidine incorporation was determined as described in Materials and Methods. One representative experiment of three is shown. B, T cells (1.5 × 106 cells/ml) were stimulated for 32 h with TPA (10−8 M) in the presence or absence of atRA (10 nM) with or without Ro 41-5253 (10 μM). Total cell lysates were made and Western blot analysis was performed as described in Materials and Methods. Ro, Ro 41-5253. One of two reproducible experiments is shown. Taken together, these results suggest that the effects of atRA on cell proliferation and the cell cycle machinery are mediated through a RAR-dependent pathway. In the current study, we have shown that physiological levels of atRA stimulate the proliferation of human peripheral blood T cells and we have examined the mechanisms involved. In particular, we have investigated the effects of atRA on the cell cycle machinery and assessed the role of IL-2 in this process. Previous reports on the effect of vitamin A derivatives have indicated that retinoids strengthen the cellular response of human thymocytes (42), of murine spleen T lymphocytes (43, 44, 45), and of murine thymic T cells (46). However, in none of these reports have the mechanisms been explored. In the current study, using normal peripheral T cell and stimulants such as anti-CD3 Ab alone, costimulation with anti-CD3 and CD28 Abs, Con A, or TPA and ionomycin, a potentiating effect of atRA was observed, but the response varied in degree and was donor-dependent. A statistically significant effect of atRA was obtained using anti-CD3 Ab as a stimulant, but the most extensive effect of atRA was noted in T cells stimulated with suboptimal doses of TPA. Therefore, we used this agent to examine the mechanisms whereby atRA stimulates T cells. The key regulatory event in the G1- to S-phase transition of the cell cycle is phosphorylation of pRB (22) and we found that atRA markedly increased TPA-induced pRB phosphorylation. The effect of atRA on pRB phosphorylation was consistent with its stimulatory effect on the events known to direct phosphorylation of pRB, such as enhanced protein levels of cyclin D3, cyclin E, and cyclin A, reduced levels of p27Kip1, and increased CDK2 activity. Of note was the delayed effect of atRA on these cell cycle parameters. Thus, in great contrast to the rapid and direct inhibitory effect of atRA on the cell cycle machinery in peripheral blood B cells (8), the effect of atRA on T cells appeared after a lag period of 20 h. This, taken together with the observation that atRA had to be added to T cells early during stimulation of the cells to enhance proliferation, indicated to us that the effects of atRA on the cell cycle machinery, and hence on proliferation, were indirect. Given the central role of IL-2 in T cell proliferation (36), we tested whether atRA would increase TPA-induced IL-2 production. We detected only marginal secretion of IL-2 in the presence of TPA alone. Interestingly however, atRA potently enhanced IL-2 secretion. Increased IL-2 mRNA synthesis has previously been observed in T cells stimulated with anti-CD3 Ab and retinol (47). However, in this previous report, the level of IL-2 secreted was not significantly elevated by retinol. By adding rIL-2 to TPA-stimulated T cells, we showed in the current study that IL-2 replaced the effects of atRA on both cell cycle regulation and on proliferation. However, the average concentration of rIL-2 (5 ng/ml) needed to replace the effect of atRA was higher than the average level of IL-2 (1.5 ng/ml) that we measured was secreted by the cells, indicating that IL-2 cannot fully explain the effects of atRA. In contrast, it is possible that the assay we used to assess the amount of IL-2 secreted underestimates the actual level of IL-2 produced, due to rapid internalization of secreted IL-2 once it binds its receptor (48, 49, 50). The notion that IL-2 cannot fully explain the effect of atRA was supported by experiments using a blocking IL-2R Ab. The Ab totally inhibited rIL-2-mediated responses, whereas it never completely blocked the effect of atRA on T cell proliferation and pRB phosphorylation. We have addressed the possibility that atRA could induce expression of other cytokines known to drive T cell proliferation and differentiation such as IFN-γ and IL-4 (51). However, we did not observe any significant changes in these parameters in the presence of atRA (data not shown). Thus, at present, we have no indications which pathways other than IL-2/IL-2R can be involved in atRA-mediated T cell proliferation. An important finding in the current study was the different effects of atRA in T cells as compared with the effect we previously reported in B cells. Whereas the proliferation of B cells is potently inhibited by physiological levels of retinoids (5, 6), T cells are stimulated by atRA. This cannot be ascribed to the fact that a different mitogen than TPA was used to stimulate B cells in the latter study, because in the current study we found that atRA also inhibited the proliferation of TPA-stimulated B cells (data not shown). A clue to understanding the mechanisms underlying the contrasting effects was provided by our analysis of the cell cycle machinery in B cells vs T cells. The cell cycle machinery in B cells was inhibited by atRA through decreased levels of cyclin E and -A and increased levels of p21Cip1 (8), whereas in T cells it was stimulated through increased levels of cyclin D3, -E, and -A and decreased levels of p27Kip1. Even more interesting was the different kinetics whereby atRA affected the cell cycle machinery in B cells vs T cells. Whereas atRA induced very rapid changes in the cell cycle machinery in B cells, the changes observed in T cells were slow and appeared to depend on the production of IL-2. In B cells, the effects of atRA on the expression of p21Cip1, cyclin E, and cyclin A were observed already after 30 min, and appeared to be regulated at the level of transcription (8). In T cells, atRA did not change the expression of p21Cip1, although it has been reported that p21Cip1 possesses a RAR-responsive element in its promoter (52). Thus, the effects of atRA on the cell cycle machinery in B cells appear to be direct, while the effects in T cells are indirect and may proceed via increased production of IL-2. An interesting question is why p21Cip1 is induced by atRA in B cells but not in T cells. It is possible that the p21Cip1 promoter in T cells is silenced or inactivated by other transcription factors. Alternatively, there can be different expression of nuclear receptor isoforms and/or molecules known to interfere with RAR- and RXR-mediated transcription (11, 12, 53) in B cells and T cells, explaining the different expression of p21Cip1 in these two cell types. In agreement with our previous findings in B cells (6, 8), the RAR-, and not the RXR-selective agonist, was able to mimic the effects of atRA, and a RAR-selective antagonist completely suppressed the effects of atRA. Thus, it appears that RARs have a key role in mediating the effects of atRA in lymphoid cells, including induction of IL-2. To our knowledge, no RA responsive elements are found in the IL-2 promoter, and therefore it will be important to clarify how RARs are involved in atRA-mediated stimulation of IL-2 secretion in normal T cells. The requirement for atRA to be added to T cells within the first few hours of stimulation suggests that atRA interacts with an early downstream signaling event. TPA mimics diacylglycerol in activation of PKC (18) and it has been shown that retinoids in certain cell types can regulate PKC activity (54, 55, 56, 57, 58). However, using a sensitive PKC assay, we did not observe any potentiation of PKC activity in atRA-treated T cells (data not shown). It has also been shown that atRA can alter the glycosylation pattern of various proteins (59, 60, 61) and glycosylation of proteins is known to affect, for instance, the protein stability (62, 63). IL-2 has a single O-linked carbohydrate chain at position Thr-3 in the protein (64), but inhibiting O-glycosylation using benzyl 2-acetamido-2-deoxy-α-d-galactopyranoside did not affect the atRA-mediated induced secretion of IL-2 (data not shown), indicating that this modification is not important for the effects we observe. Taken together, the data presented in the current study provide important new information to understand the mechanisms whereby atRA stimulates proliferation of normal human peripheral blood T lymphocytes. The potentiation of proliferation induced by atRA clearly involves RAR-mediated stimulation of the cell cycle machinery and these effects can be explained by increased production of IL-2. We are currently investigating the mechanisms whereby atRA stimulates secretion of IL-2. We thank Dr. Maria I. Dawson for providing the RXR-selective agonist SR11217, Dr. M. Klaus for providing the RAR-selective antagonist Ro-41-5253, and Hilde R. Haug for excellent technical assistance. ↵1 This work was supported by Norwegian Cancer Society, Norwegian Research Council, Freia Research Foundation, Jahre Research Foundation, Nansen Foundation, and Rakel and Otto Kr. Bruun’s legacy. 3 Abbreviations used in this paper: RA, retinoic acid; atRA, all-trans RA; 9cRA, 9-cis RA; RAR, RA receptor; RXR, retinoid X receptor; TPA, 12-O-tetradecanoylphorbol 13-acetate; PKC, protein kinase C; pRB, retinoblastoma protein; CDK, cyclin-dependent kinase; CKI, cyclin-dependent kinase inhibitor; TTNPB, 4-((E)-2-(5,6,7,8-tetrahydro-5,5,8,8-tetramethyl-2-naphthalenyl)-1-propenyl)benzoic acid; BrdU, 5-bromo-2′-deoxyuridine; PI, propidium iodide. Blomhoff, H. K., E. B. Smeland. 1994. Role of retinoids in normal hematopoiesis and in the immune system. R. Blomhoff, ed. Vitamin A in Health and Disease 451 Marcel Dekker, New York. Coligan, J. E., A. M. Kruisbeek, D. H. Margulies, E. M. Shevach, W. Strober. 1992. Measurement of proliferative responses of cultured lymphocytes. Current Protocols in Immunology 7.10.1. Wiley, New York. Blomhoff, R.. 1994. Overview of vitamin A metabolism and function. R. Blomhoff, ed. Vitamin A in Health and Disease 1 Marcel Dekker, New York.